I love to visit St. Augustine,Florida half an hour from my home I try to visit at least once a month. There is this beautiful church there called Our Lady Of La Leche. On these historic grounds I stop at this filled to the brim religious shop where they sell all things holy for your home and for gifts. My family has had some health issues and I being Catholic wanted and NEEDED to pray for them. 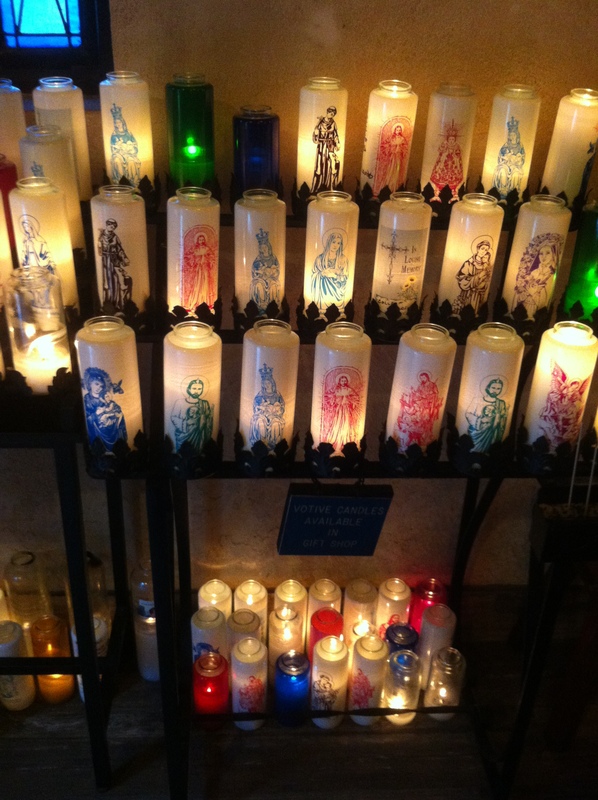 you can buy these amazing candles in this store and go to the mini historic chapel and pray to God, Mary his mother or a saint of your choice. I have always loved the peace I feel from looking at these lit candles and the ritual rich in history. In NYC,Washington D.C. and in my travels throughout Europe. I adore the way the candles light up the room,my face up and best of all what they do for my soul. There is beauty all around us. I usually right about beauty or skin,lifestyle,food,share recipes and or my travels. But this week I wanted to share with you to light a candle wherever you are and just glow! There is beauty all around us. Yes, even in everyday life,seek it and it will come to you. Bask in the light around you and shine on …Beautiful, Shine on!